What Does the Journey of a Drip of Water Look Like? Raindrops, running into a stream. Flowing, over rocks, through valleys; either muddy or clear. Into rivers, now rushing, roaring. Carrying what’s sometimes meant to be left behind. To an ocean, calm and restless. As a contemplative teen back when, I penned this poem while sitting near the edge of a small waterfall near my home. I’ve thought back to these metaphoric words many times since then, especially when a rain drip startles me by hitting me in the eye or when I hear the sound of a dripping faucet. Water is an estimated 53 to 75 percent of an average human adult’s body weight; it is essential to live. When I get very thirsty, the sensation provokes anxiety and an urgency to drop everything and find something to drink, now. But drinking too much water too quickly can kill by so-called water intoxication. So like many things in life, finding a balance between the extremes is important. Do I drink enough, but not too much, water? As a society, how do we value water? Do we take it for granted? Do we conserve it or waste it? Do we pollute it? Do we protect it? How do my actions contribute to those of the whole? 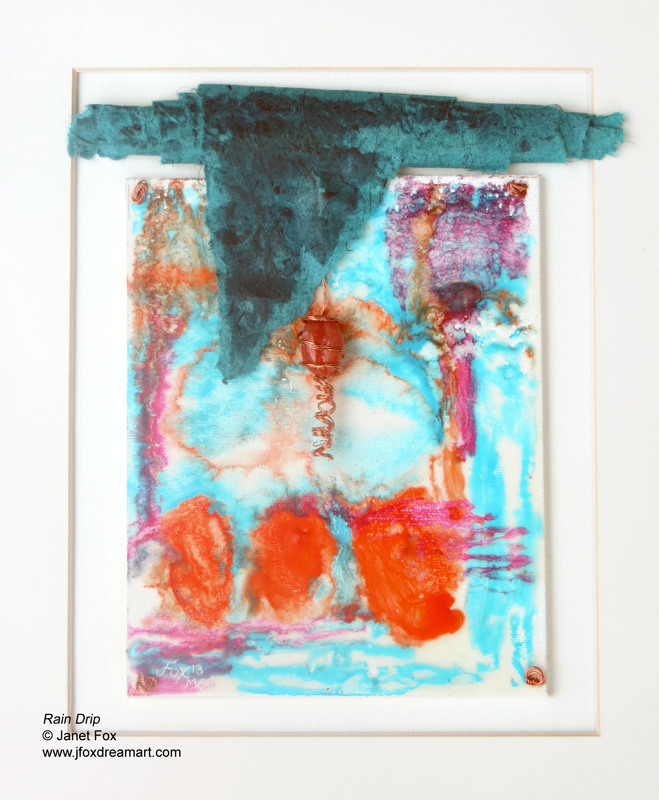 My encaustic mixed media art, “Rain Drip,” is a contemplation on just one droplet or drip of water as captured during its free fall on its way to puddles below. Here are some others’ ideas about water; enjoy! A beautiful classical album titled, “The Drop That Contained the Sea,” by composer Christopher Tin, devoted to the movement of a drop of water and sung by singers from around the world. “Water Has Memory” is a video by Love Nature and Oasis HD showing a curious and surprising experiment. “What If You Stopped Drinking Water?” is an illustration-as-you-watch video by ASAP Science describing our essential need for water. “8 Water Tricks That’ll Melt Your Mind” by Buzzfeed are fun to try. How do you relate to water? What does water mean to you?